Below is a tiny little story that I recently put together and I'm sharing it with you here on MeetAdamJones.com. If you have any comments of suggestions for future material, let me know in the comments. When the youngest McMillan girl moved out, she put her childhood toys in the attic of her parent's shed. Each treasured memory was placed lovingly, for she would be back for them one day (there was just no room in her new apartment). To make sure that her dolls were sufficiently content without her, she fashioned a tea room out of her old play-sets and put it by the window overlooking her family's orchard. There were tiny tables, cups, counters, and even a functional piano. When it got dark, she hung up a couple of strings of old Christmas lights so she could keep working. Once she was satisfied that everything was in order, she climbed down the ladder and embarked (as bravely as she could) upon her new life. The toys in the attic sat undisturbed until the cold winds of autumn came. The walls of the McMillan house became home to a nice family of field mice, the barn took in some owls, and the attic of the shed became a hangout for some of the local squirrels. Murray, an older squirrel, was still tough from a lifetime of hard work, but beginning to wizen. 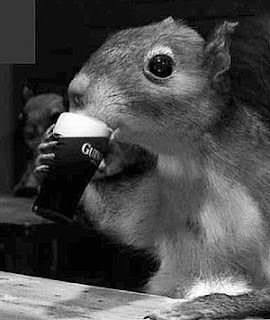 It was Murray who first found the attic and took to passing out acorns of the farmer's hidden cider to others who happened by. This caused others to happen by quite frequently. After a few weeks of experimentation in various states of sobriety, a young squirrel named Chauncey learned to produce something quite resembling the Blues from the tiny piano. Chauncey, though young, had lived a turbulent life and was able to express it through notes sometimes haunting and sometimes mellow. Folks would stop by under the glow of the forgotten Christmas lights, offer Murray up a bit of food, and enjoy the company, or just a quiet drink by the window. Gary was usually quite lively. He was the type that tried to be a bit more clever than he was. Some of his jokes would have people clutching their sides and twitching their tails. Other jokes brought out the one halfhearted laugh that trailed away as they looked for something that needed them to be elsewhere. That night, though, Gary was the quiet drink by the window type. “Why? You’re no good at that kind of thing,” she teased. “Yeah, I’ll make sure to do that.” She waved and walked to the exit. Gary lost himself in thought about the upcoming proposal, and wedding, and honeymoon, and family. Shelly climbed down the ladder and embarked (as bravely as she could) upon her new life.